General tickets are around 30% off between August 23rd and August 26th. Please check individual ticket prices on the form. Please note that for certain performances, only limited numbers of discounted tickets may be available. These tickets are sold in advance per performance. Tickets go on sale on August 27th at 10:00. If you want to see three or more performances at the festival, purchase a pass and get between 10-25% off the price of single tickets. Please choose either the pass for three performances or five performances. All three or five performances must be reserved at the time of purchase. Reservations cannot be changed at a later date. Due to limited availability, it may not always be possible to reserve a performance. Passes are valid only for the purchaser. Passes cannot be used for purchasing tickets on the door. Discounted tickets are available for students, including tickets priced at a flat ¥1,000 for high school students or younger students. When collecting your tickets at the venue box office please show your college student ID or, if you are a high school student or younger, something that proves your age. 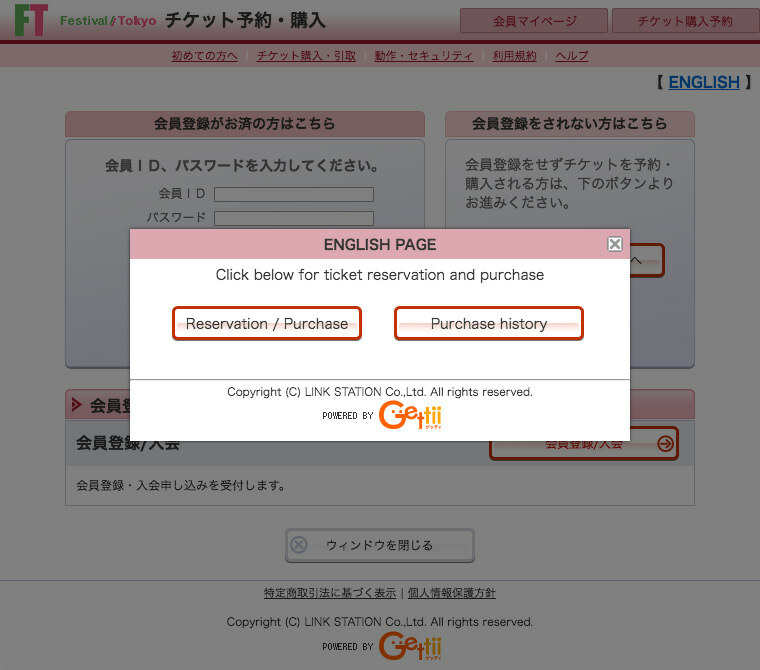 Click “ENGLISH” on the ticket reservations and purchasing page. Click “Reserve” for your choice of event. Select the type of seat and ticket for your choice of event as well as how many tickets you wish to purchase. Choose your seat if it is an event with reserved seating. Enter your credit card information. Accepted credit cards are Visa and Master Card. Please retain your order number. Along with your telephone number and name, this is required in order to check your purchase history. Purchased/reserved tickets can be collected from the venue box office 1 hour before the start of the event. Tickets for “Cabaret Crusades” are only available from Ikebukuro HUMAX Cinemas. Tickets cannot be purchased from the F/T Ticket Center. 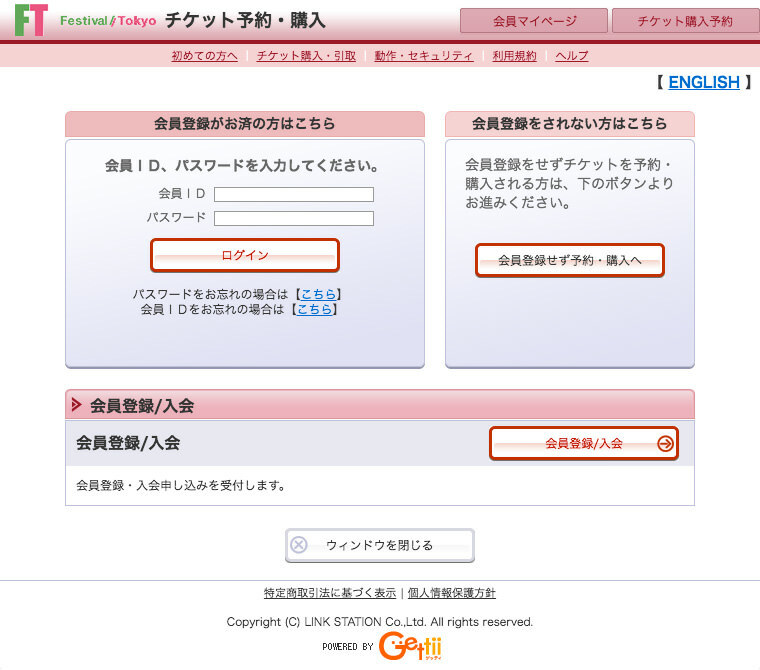 Please select the button for your choice of ticket type (Festival Pass 3 Performances or Festival Pass 5 Performances). After entering the required items of information, please select your choice of performance and ticket quantity, and then click the confirmation button at the bottom of the screen. Within one week you will receive a reservation confirmation email from the F/T Ticket Center, along with a PayPal invoice. Please complete your payment online using PayPal before the date designated on the invoice. You may pay by credit card or debit card. “Cabaret Crusades” is not available with festival passes. Tickets for “Cabaret Crusades” are only available from Ikebukuro HUMAX Cinemas. Please pay for your tickets when you collect them from the venue box office. 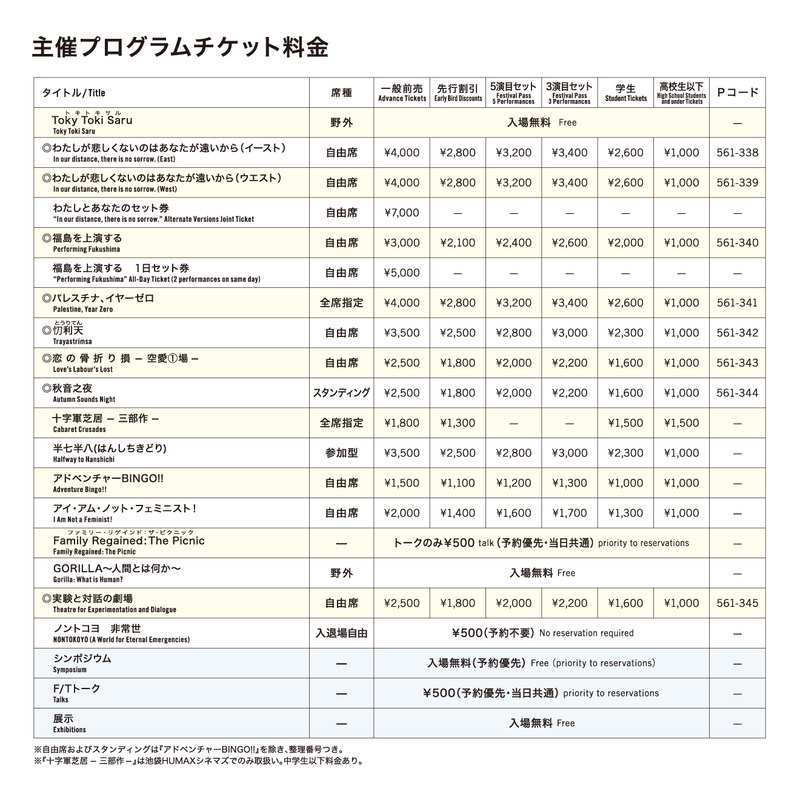 There is a handling fee of ¥108 per ticket purchased from the F/T Ticket Center. For tickets with reserved seating, customers who arrive after the performance start time may not be able to sit in their designated seat. Performances with unreserved seating tickets are sold on a first-come, first-sold basis. At the time of reservation or purchase, numbers are assigned indicating the order you can enter the auditorium to choose your seat. For tickets with unreserved seating, please arrive when the doors open (usually 30 minutes before the start of the performance) or your number may become invalid. Audiences using a wheelchair should please contact the F/T Ticket Center in advance to arrange assistance at the venue. Children under school age are not admitted to performances (except for “Adventure Bingo!!”). Ticket prices are inclusive of sales tax. Tickets on the door are sold from 60 minutes before the start of the performance at the venue box office desk. Venue opening times vary per performance. Please check details for each performance on the festival website.